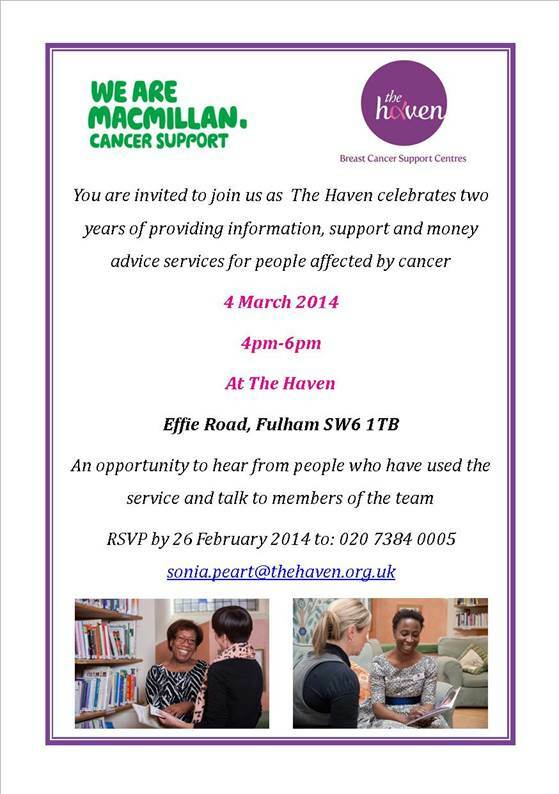 This afternoon I was invited to an event at the Haven in Fulham. During my journey I never contacted the Haven as I believed it was solely for people affected by breast cancer. I understand it was once, but not anymore, not totally. Great news for people affected by cancer to have another resource nearby to help them through and beyond a diagnosis. 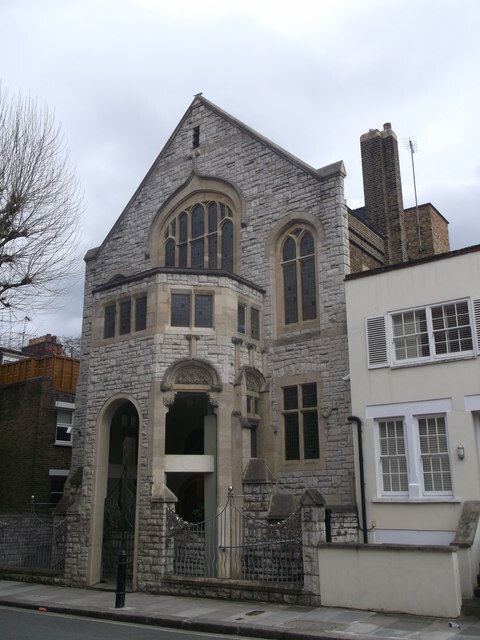 The Haven is located just behind Harwood Road in Fulham, a few minutes walk from Fulham Broadway tube. Housed in converted church which from the first moment of entry, feels comfortable and calm. The interior of the ground floor hosts a reception area, a seated area and then on a slightly higher platform another seated area with plenty of sofas, a small kitchen on one side for people to get a warm cup of tea and the other side plenty of information leaflets, computers and books. I understand that there are four floors in total in which there are a great number of consultation rooms, treatment rooms, a large group room and another for exercises. The kitchen serves great delicious and healthy food at lunches on Monday to Wednesdays. There are nutritionists available to offer advice and whom also run courses and phone consultations to those who want advice. I was pleased to hear this evening that they are now open late on a Wednesday evening for people to drop into the Centre. Whilst I understand that it’s hard to staff cancer Centres in the evening and weekends, I feel it’s imperative that more centres are available to those who are working or perhaps have children that means they’re unable to get away during the working day. I was also pleased to hear the services are now being offered to people diagnosed with other cancers, other than breast cancer. If you would like support or information, do have a look at the services offered at the Haven. They also have centres in Hereford and Leeds with another one opening in Wessex. 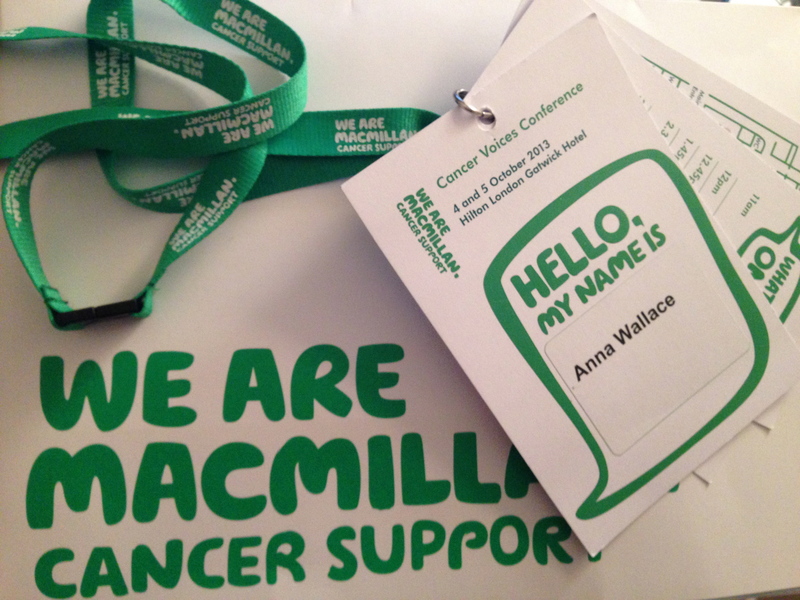 As a Cancer Voice and patient advocate I attended the Macmillan Cancer Voices Conference. This is held each year in a hotel at Gatwick and runs for 2 days with plenaries, workshops and networking. The attendees are a mix of people newly affected by cancer (diagnosed or carer) together with some old stalwarts who are, like me, advocating for themselves and others. Many of us ‘old guard’ sit on various other tumour working groups, networks, research, NHS or hospital boards, Healthwatch/LINk, charity or patient groups. My aims in attending this conference is to be able to share my experience (and that of others I’m familiar with), contribute to discussions at workshops and also come away with more knowledge about new and ongoing projects. I also like to take the opportunity to share with Macmillan projects that are underway or consideration by other organisations and that perhaps they could work collaboratively or in conjunction with these others rather than reinventing the wheel. The agenda is, as always, busy. Attending these conferences isn’t for the faint-hearted and for some can be difficult. Welcome from Julia Palca, Macmillan Trustee (Chairman of Board). Julia explained that she joined CancerLink in 2008 after her own diagnosis. CancerLink was taken over by Macmillan and is now known as Cancer Voices. Cancer Voices tell us what people affected by cancer need and how they need it. Your Voices are influencing changes in cancer. Challenging times for the health service. We continue to fund-raise, deliver services and influence. 2012 was the most successful for fundraising. £115m raised. £112 spent on people affected by cancer. 8,000 more people reached than the year before. Big part of reach is our Macmillan professionals. 3,000 funded last year. Influence and force for change work. e.g. free social care at end of life. Welsh care delivery plan. Northern Ireland cancer commissioning plan. Early diagnosis. A GP will only see 8 or 9 new cancer patients a year (on average). We need to raise awareness for GPs and have developed ClinRisk Tool (QCancer Overview). It has now been piloted in 500+ GP surgeries. Over 800 GPs attended training for early diagnosis. Improve patient experience. We’ve been working toward: High quality communication patients and staff; Patients involved in decisions; and Coordinated care between settings. NHS National Cancer Experience Survey. Macmillan is working with partner organisations to improve on results. 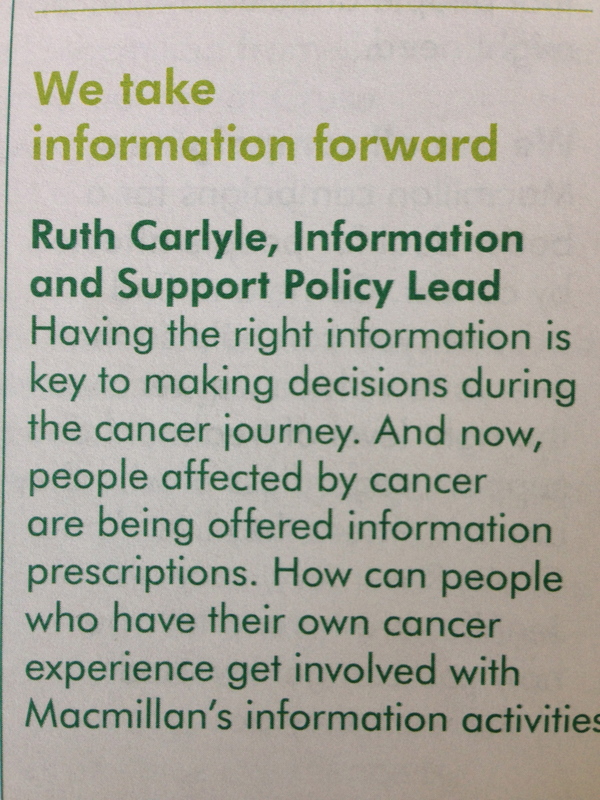 Cancer Voices and Healthwatch to co-create Macmillan’s guide to using the survey. Copies can be obtained from BeMacmillan. Campaigning for carers. 1.1m cancer carers in the UK. 50% don’t identify as carers or realise there is support available to them. This month Macmillan are launching a new campaign to reach carers and also lobby care bill to strengthen and support carers. Redesigning cancer care systems. 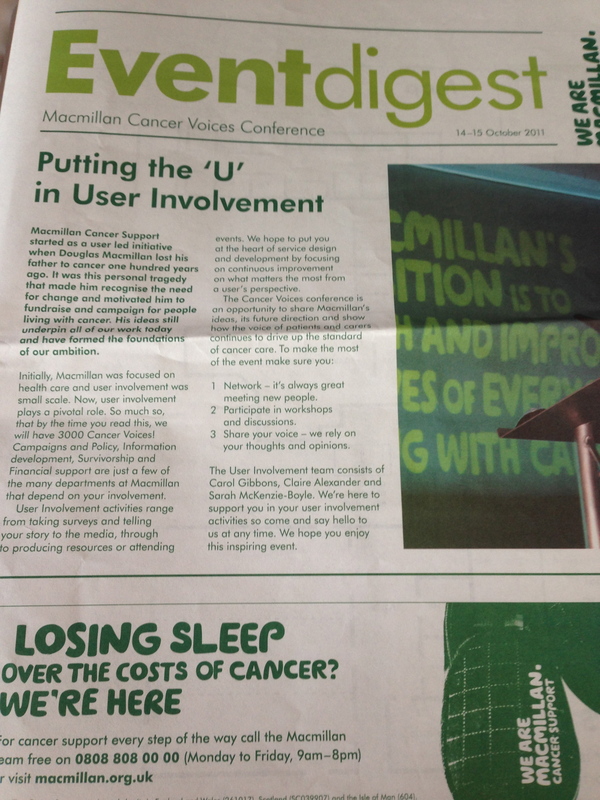 Macmillan are encouraging user involvement working group as part of the programme of changes in the NHS care system. Exciting programme ahead and a great deal of opportunities for patient/carers to get involved and improve care. Neil Stevens VP of Skype – keynote session. Neil described his own experience. At the time of his diagnosis, he thought nothing of jumping on a plane for a day of meetings in Sydney and did this regularly! He was focused, impatient, driven and busy. Life was good. At the young age of 43 he noticed a lump on his hip. He was overseas on a business trip. A local Dr told him not to worry. He carried on with his business trip. Back to the UK he sought more medical advice and scans. Initially he was told it was nothing to worry about. He was fortunate to have private cover and once again pushed for more tests. Eventually he had a diagnosis – a rare form of sarcoma – extraskeletal osteosarcoma. So he knew the name but little else. The tumour was removed by surgery and he was back at work in 3 weeks. His life returned to ‘normal’ as if it never happened. At a routine scan 6 weeks later life however he was told that the sarcoma was back and now in his pelvis and lungs. They stated that there were over 100 tumours in his lungs and told he probably had 18 months. So he put on his business head. After all he was driven, focused and able. He became the Cancer Elimination Officer (CEO) of his cancer. Neil said that he had to address the cancer in the same way he addresses any business problem. He first gets all the facts and data (no small task when there is so little), he would then build a strategy to eliminate it. He was sure he would be able to do so. He’s fortunate that he had money and contacts to track down and seek advice from the world’s expert at Sloane Kettering in the USA. When he met with them, the consultant told him ‘You can beat this’. Neil said that hearing that meant he knew it was true. Once again an incredibly positive attitude. He started chemotherapy immediately. He knew that there was no sign of activity after round 1. He kept telling everyone he could that he would beat it. He kept a positive mind. The final round scans couldn’t find anything! What he learnt was the power of his own mind. He’s very factual and needed information. BUT he knew he could take control and manage it. Neil went for counselling, took up pilates, changed diet, aware of power of his own body and mindful meditation. The hardest part was telling the children. Macmillan helped. He knew deep down he could do this. He knew that by addressing it as he would a business deal, he’d be able to command what he knew he needed and be in control. He wrote a document justifying why Cyberknife should be used not radiotherapy.. he got it. He found a trial in the US. He did a PowerPoint presentation of why he should get on the trial. He got it. He’s now been back at work full time for a year. He’s moved to a new role which is less stressful. He believes fitness and Pilates played a part in his health. He meditates whenever he feels worried or panics. He’s learnt to keep perspective. He did have a small relapse in June with tumours in his lungs however is now completely clear following surgery. Skype’s amazing and free and global. He works for Skype. What if we built a tool that allowed people with cancer connect? Now the Skype Buddy system has been built and is being piloted. The principal is to enable people affected by cancer to be able to talk to specialists (financial counselling, medical etc) or patient to patient or carer to carer. (I’m not sure if there will be group discussions but hope there will be as it would be a great opportunity to have group chats on specific subjects with perhaps nurses or clinicians on the call too). Digital advisory board for Macmillan that he’s putting together has representatives from the likes of Facebook, Expedia, Amazon etc. What is Skype Buddy system? Click here for explanation. The system is being piloted currently and looking for people to get involved, use the system, provide feedback and evaluate. At present the system appears to have a small number of cancers and a limited sign up criteria. I wonder if this will be increased in order to match Buddies on better criteria. I am an Imerman Angel whereby we mentor others with the same cancer diagnosis by phone, Skype, email, letter etc, as required. I’m a little disappointed that when I spoke with a number of charities, NCAT and NHS representatives about the Imerman Angels some years ago it was dismissed as a crazy idea to ask people to use technology to speak to someone similar! Hey ho, I guess time and mindsets have moved on. Imerman Angels match us on a huge number of criteria including age, marital status, children and cancer. Although it may seem excessive, I know that some of that criteria would have been critical in my journey. I have offered my experience to this project as I have worked with IT online projects for many years and also the Imerman Angels system (which I continue to mentor for). We need more types of cancer in Skype Buddy project so that there is perfect matches. For example (and perhaps selfishly for me) ‘soft tissue sarcoma’ is not defined enough. Sarcoma cancer can occur anywhere in the human body and issues that may affect someone with Phyllodes in the breast will no doubt be different to someone with an Leiomyosarcoma. Skype Buddy is about 1:1 relationship. I do hope this will open up to group chats on specific topics. We also need to ensure the supporting Buddies are provided with good (ongoing) training. They should also be provided with the ability to reach out for support for themselves. We need to use technology better and use it as a key element of the broader strategy. Feedback on the projects we’re involved in. Updates from the previous conference. Sharing information, data and reports with others. Working collaboratively to provide information. Following an exercise to introduce ourselves to other Voices at our table and then a ‘ice-breaker’/competition, the workshop began. 3. Mid Staffs and the Francis Report. The final report and executive summary can be viewed here. Failings of Care at Mid Staffs – Robert Francis QC Feb 2013 stated “This is a story of appalling and unnecessary suffering of hundreds of people”. The priority of his report, he said, was not to find a scapegoat, but find ways of putting patients and the quality of care first. Not just cancer.. of course the mortality of all illnesses was too high at Mid Staffs. Waiting times for cancer patients to see specialists were far too long which meant that many people died where as they should have been saved. Chronic understaffing on cancer wards. Lack of commitment to improving outcomes for cancer patients. Obsession for reaching targets but not standard of care for living longer and better quality of life. No rapid referral system to oncologists which should have been in place. Lack of support for the clinician from the MDT surgeons. Failing to tackle a negative culture involving a tolerance of poor standards and disengagement. Increased focus on reaching national access targets, achieving financial balance and seeking foundation trust status. How do we know if patient experience is good/bad? 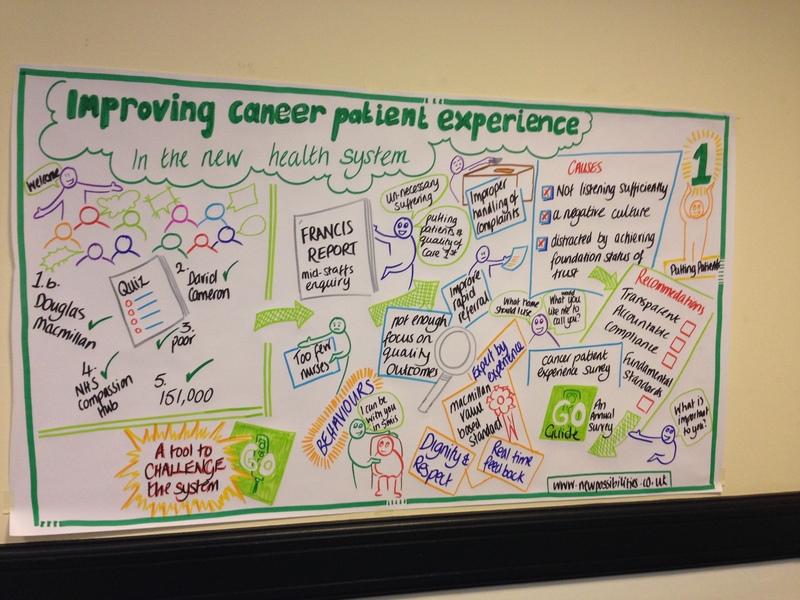 There’s the NHS cancer patient experience survey, peer reviews and several different areas. Value Based Standard is a set of behaviours that is practical developed by patients and carers. 1. Naming – I am the expert on me. 4. Clinical treatment and decision making – I’d like to understand what will happen to me. 5. Acknowledge me if I’m in urgent need of support – I’d like not to be ignored. 6. Control over my personal space and environment – I’d like to feel comfortable. 7. Managing my own – I don’t want to feel alone on this. 8. Getting care right – my concerns can be acted upon. Sadly a great deal of these ‘standard’ points should be what we do every day as humans. Why do we need standards to ask a medical member of staff to remember to ask how someone wants to be addressed? Anna, Ms Wallace, Miss Wallace etc. The survey was completed by over 70,000 people and covers care before, during and after hospital. Does it survey the family of deceased cancer patients about their experience? We spent a short amount of time looking at extracts of the Survey and attempting to work out where we might feel improvement should be focused. The Survey results are lengthy and difficult to interpret. There are many tips on doing so, such as look at the figures for last year and this year to see if there has been an improvement. How does that Trust compare to other Trusts? If many Trusts performed badly, could you Trust improve sufficiently to be hailed as the ‘gold standard’? In the final minutes of the workshop we discussed what we might do as patient/carers/advocates to ‘encourage’ our local Trusts to improve, with measurable improvement and to be held account. I had been booked into a workshop by Healthtalkonline. Disappointed that they weren’t in attendance at the conference as I wanted to find out first hand more about their work, strategy and future plans. Perhaps next year? The first day of Conference ended with a networking opportunity via drinks and then dinner. It is always a joy to meet up with friends at this Conference, many of whom I don’t see from year to year (except on social media). This year the entertainment was provided by a singer who crooned his way through a whole host of fabulous tunes. On our table we seemed to know all the words and were (I think) the first ones up for a little dance! Great fun and perfect entertainment for this event as it appealed to pretty much every age group (the joy of Robbie Williams doing covers!). The second day began with the second workshop of the conference. The theory is that we are all commissioners. I’m buying for my needs. I look for value for money, choice, what I need, who am I buying for, can we afford it and quality. Health service commissioning is similar. It happens all the time. Some stuff will be bought every week. some things might be purchased for special occasion. Assessing needs -> Needs assessment -> Planning -> Specifying -> contracting -> evaluation. Clinical Commissioning Groups (CCG) now do the ‘buying’ of services in the new NHS. CCGs are a group of GPs that come together to form a group to commission services. No boundaries are set as to how many GPs are required or the maximum number either. There are now over 200 CCGs. £100bn is the NHS budget and £65bn of which goes to the CCG. Do GPs know what to buy? How are these different CCGs going to ensure that nothing slips between the geographical groups of CCGs? 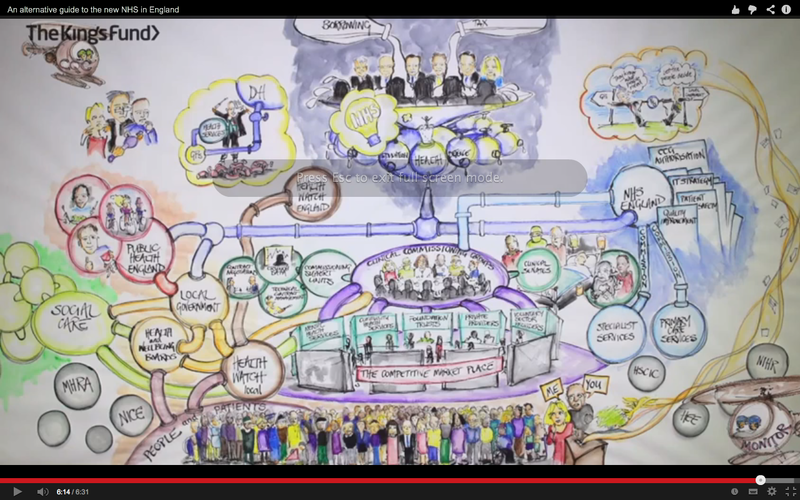 Kings Fund video – An alternative guide to the new NHS in England. Sadly we didn’t get to see it as the broadband was too slow.. perhaps it should have been downloaded prior to the conference to play locally? We then worked (as best we could) through picture handout (final slide of video below – click to enlarge). All organisations involved have a duty. Briefly, who is involved? Public Health England – more proactive, awareness and prevention (sit within the council – local government. Social care – care of the elderly, supporting people with disabilities, someone post cancer treatment needing assistance at home. Health & Wellbeing boards – brings together main leaders in particular area. 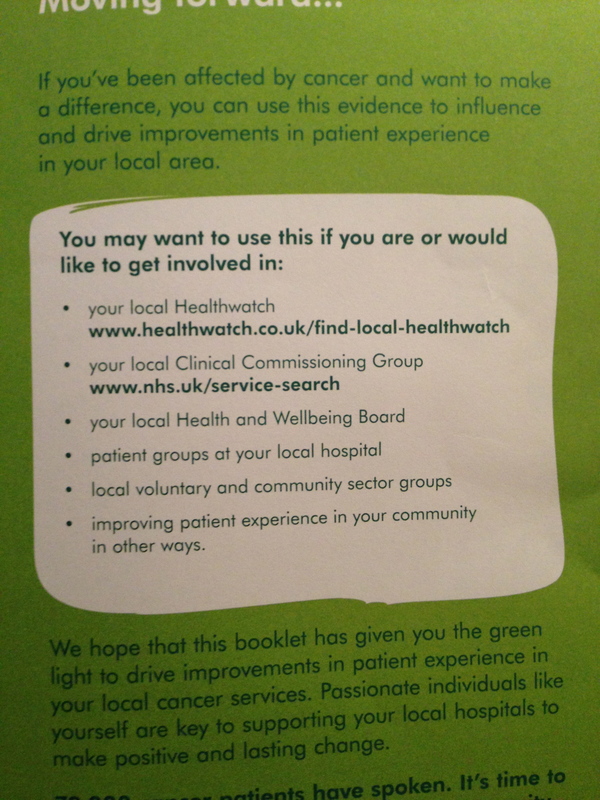 Healthwatch – responsible for supporting public voice in monitoring health and social care locally. Cancer Commissioning. Commissioning Support Units support the CCGs and, in the most part, are made up of the original ‘commissioners’ in the old NHS structure. HOWEVER one of the significant rules for CCGs is that they have to engage with members of the public. How can you influence what is happening locally? Patient Participation Groups – ask for information at your local GP surgery. Hospital boards – find out which boards have patient representation. Health and wellbeing boards making decisions about the needs of the local area. Or at a regional level. Make enquiries. Ask where you can be involved. If interested in cancer commissioning get involved with strategic clinical network. Not sure where to start? How do you get involved? Start with Macmillan involvement coordinators who can advise on where to go. Consider the second position – what does the other person think? Explore the barrier, empathise, re-present. My final workshop of the conference was on a subject I’m passionate about. I hoped to find out more about initiatives that Macmillan are involved in to improve care for people living beyond diagnosis. Survivorship being from the first thought of cancer until the last breath… not just post treatment or for a set period of time. In 2010 there were 220,000 living with and beyond cancer. In 2030 it is projected that there will 370,000 (1 yr survival); 570,000 to 990,0000 (1-5 yrs) and 1,290,000 – 2,680,000 (more than 5 years). Often it is spoken about that the number of people living with cancer is set to double by 2030. We are already struggling to accommodate the increased numbers of cancer patients. If the numbers are correct we need to be collaboratively working for survivorship – charities, NHS, local health, patient groups etc. Another projected figure that truly is worrying is that by 2020 almost 50% of Britons will get cancer but 38% will not die FROM cancer. 38.7% of cancer survivors are of working age ie 18-64 = 38.7% If this percentage of working people living with a cancer diagnosis continues at almost 50% of the population then it will have a huge impact because of needs and use. Median survival times are improving. 1971-72 = 1 year whereas 2007 5.8 years. Cultural – focus on recovery, health and wellbeing. Holistic assessment 9 individual and personalised care planning. Self management – not clinical follow up. Patient Reported Outcomes Measures (PROMS) not clinical activity. My cancer treatment – gives national cancer experience survey results, and peer reviews, what hospitals are centre of excellence, mortality rates and survival rates etc. New document prepared by the NCSI “Living With and Beyond Cancer: Taking action to improve outcomes 2013“. Physical activity and healthy lifestyle. Information financial and work support. Treatment summary and cancer care review. Macmillan Identifying your concerns checklist (white form) which is completed by the patient/carer and then returned to the specialist (holistic needs assessment). This is then discussed and worked through with the Care plan which then has a plan of action etc. There is an excellent piece on the NCSI website which explains each part and also has downloadable forms to adopt for good practice. These are also available on the BeMacmillan website. A useful tip for the Treatment Summary use was for the purpose of travel insurance. As any cancer patient knows travel insurance can often be difficult and expensive to find. Macmillan advised that the Treatment Summary form could be used as the basis of medical information for this purpose. My own travel insurance is through InsuranceWith who specialise in travel insurance for people with long term conditions. We spoke about the importance of Health and wellbeing events being held locally. It was suggested that through the patient participation groups this could be set up and achieved. Also to contact your Macmillan Involvement Coordinator to assist and perhaps provide some funding. In order to sustain recovery, perhaps via self care with support and open access to the medical teams. Shared care within the hospital environment and local, social and self care. However complex cases must be managed through an MDT. Care co-ordination and remote surveillance. This needs collaborative working between the clinical setting and local/social care together with third sector organisations. Walking for health is a scheme whereby walks are organised for free locally. However could more be done. If you have high blood pressure or a heart complaint you are entitled to some physical exercise grant/access however as a cancer patient there is no physical exercise grant/access available yet. This should be highlighted.. could you raise this with your MP? Work and cancer – Often this is overlooked during treatment but essential for so many to be able to return to work in some capacity. Macmillan advise people NOT to resign but to find a working solution with your employer. Taking action – Innovation to implementation: Stratified pathways of care for people living with or beyond cancer- A “how to guide” was published by NHS improvement in 2013, and provides local teams with a very practical ‘how to’ guide based on the experience of the test sites. Improved outcomes for people living with and beyond cancer. Can you help ensure that this happens? The final plenary session, “A journey with a view from 3 sides of the fence”, and close for the Conference was given by Johnny Browne who was a GP, was a carer for his wife with cancer and is a Macmillan GP advisor for Northern Ireland. Do not forget as a GP the importance of self esteem and body image in cancer patients. Take pity on the poor GP who is like a penguin. Don’t refer too many patients. Make sure all your referrals meet the referral guidelines? Most of the time the GP didn’t miss anything as often symptoms can be something else too… but we’re improving in seeing patterns. How many people do you get in contact with during your cancer journey? Sensitivity, know your patient, what they want, how they should be addressed etc. Difficult for me as a GP to navigate the cancer journey. It can be extremely difficult for someone who is new to the NHS and ‘cancerland’. 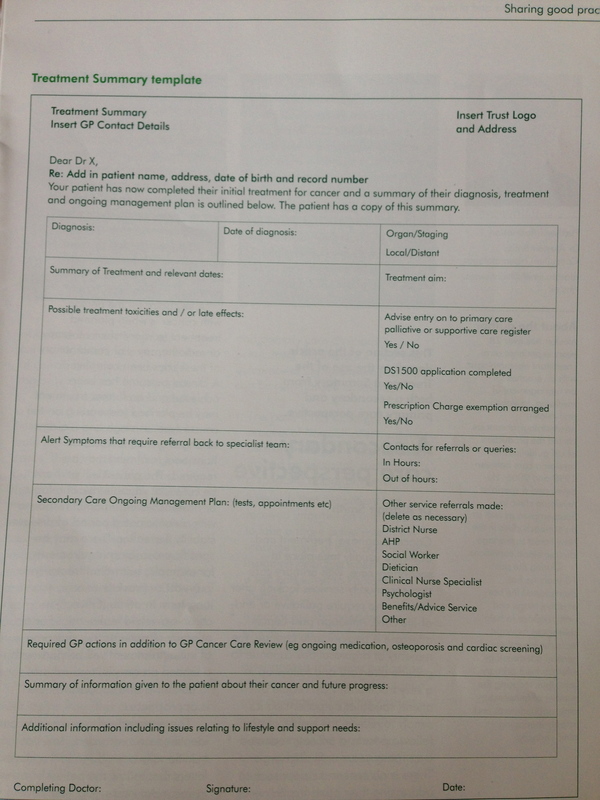 Treatment summary – Macmillan have developed this and it explains what happened to the patient. 3 copies – patient, hospital and GP. You can take this with you in the case of emergency, insurance or advice. Health care professionals can do better. Difficult care pathway – passport to death. Talked to the patient to obtain the information rather than GO through a form. People and organisations have made the form more important than the patient – we need to change that back and hear the story rather than fill the form. 1 or 2% who give you bad communication can undo all the good of the rest of the team who give great communication. When you are going through you cancer journey, we don’t or are reluctant to complain. Perhaps it’s up to us to put the message out there or complain for others (factually, professionally and politely). I knew nothing as a GP nor as a carer but as a Macmillan GP I do… from you. All cancer patients need follow up and review. Travel insurance for those affected by cancer. Remember to live.. we did House building in Zambi, white water rafting and more… remember to Live. Why can’t you be one of the small survival percent. Remember no one should face cancer alone. Not of medical things but also happy fun memories and thoughts. It can be a lonely disease even with family and friends. Its changing. How does someone with a chronic condition have a relationship with the GP? It’s in change or flux. GP out of Hours 2013. Important to a cancer patient to be able to access GPs out of hours. Could they avoid the A&E admissions? But A&E is often not a great place for a cancer patient to be first hand and stuck on a bed in a hallway. We need to get quicker access. “I hope you enjoy your new job with Macmillan to help people with cancer and to bring your personal experience to this”. 1/ Sending out by email or post preliminary information for reading prior to the Conference. 2/ All Voices are attending to participate. I don’t think there’s a need for an ‘ice-breaker’ in each session. It just wastes time and irritates those who want to get on with the discussion. 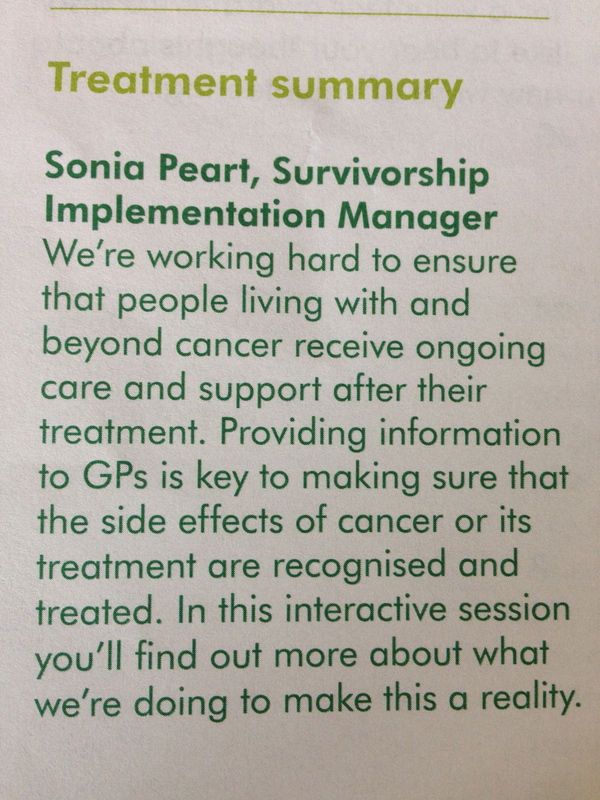 3/ Whilst all Voices attending have a personal experience of cancer (diagnosed or as a carer) it should be encouraged to, if required, use snippets of their experience if pertinent to the workshop. 4/ Should some of the workshops be for newbies and some for ‘old stalwarts’? 5/ Should there be a workshop on ‘how to complain’ so that many of the ‘negative’ experiences that participants feel they need to share can be addressed in this workshop in a constructive manner? 6/ So often during the conference people bring up negative experiences and complaints with the health system. Could Macmillan also encourage people to report when things have gone well and encourage best practice by highlighting that someone has excelled at their job! We all like to be appreciated and there are a great many people doing a fantastic job in the NHS and cancerland – we must learn to say thank you! As a patient advocate I often get asked to attend conferences and meetings. 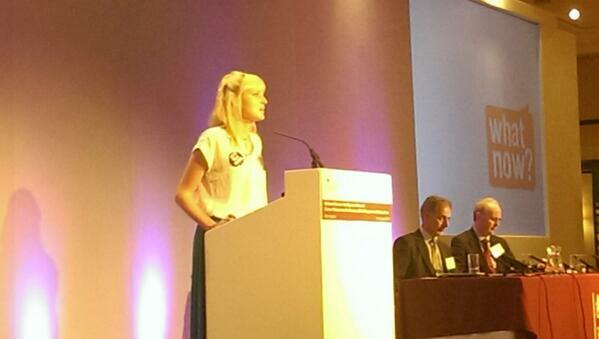 Part of my role as a patient advocate is to share my learnings both as a patient and subsequent to treatment. The piece that is invaluable to organisations is that patients can work independently of any charity or company mandate. By this I mean we are able to speak our minds and say what we think or what we have learnt without needing to be loyal to the green of Macmillan or Pink of Breast Cancer or Yellow of Sarcoma. Macmillan Voices are a scheme set up for patients and carers to have a ‘voice’ within Macmillan and help shape future services by their involvement. It is often by way of focus groups on particular subjects (I’ve done many of these for them) or by completing surveys or reviewing leaflets and documents before publication. 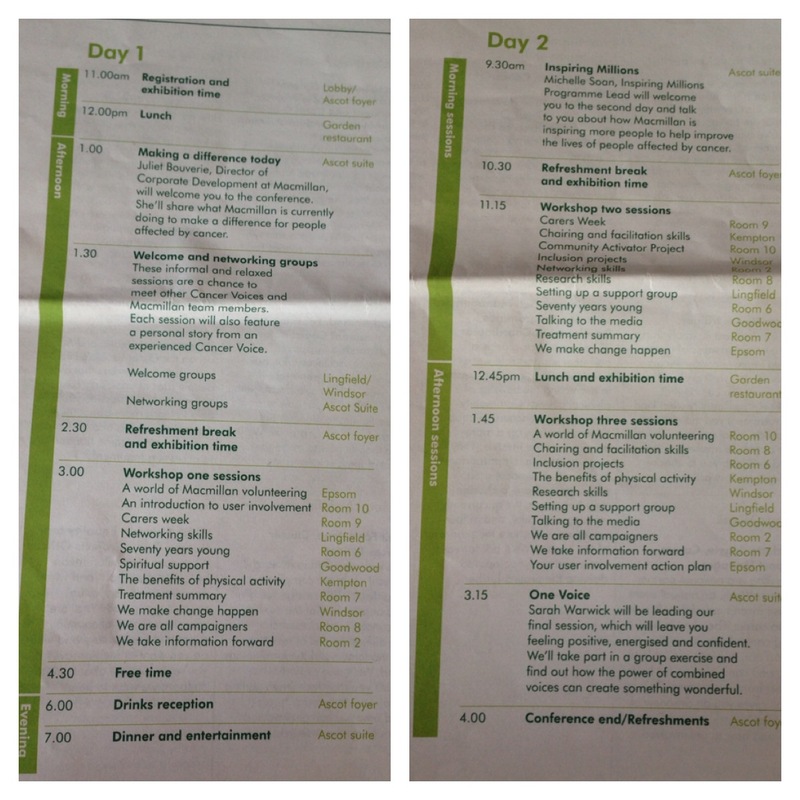 The Macmillan Voices Conference is an annual event where the Voices get the chance to get together. Throughout the 2-day conference there are workshops and networking groups. There is clearly a great deal of investment from Macmillan in the Conference and I truly hope that the work we, the Voices, are doing during the Conference is used effectively. I’m acutely aware that this is funded by people’s hard earned money donated via some fundraising event. We are welcomed to the Conference during the opening plenary by Juliet Bouverie, Director of Corporate Development at Macmillan. Juliet introduces herself (she’s new to the role) and tells us a little about why she’s passionate about her role in Macmillan. She also talks a great deal about the fundraising at Macmillan, some of the events that have happened and how grateful they are for all the monies raised. 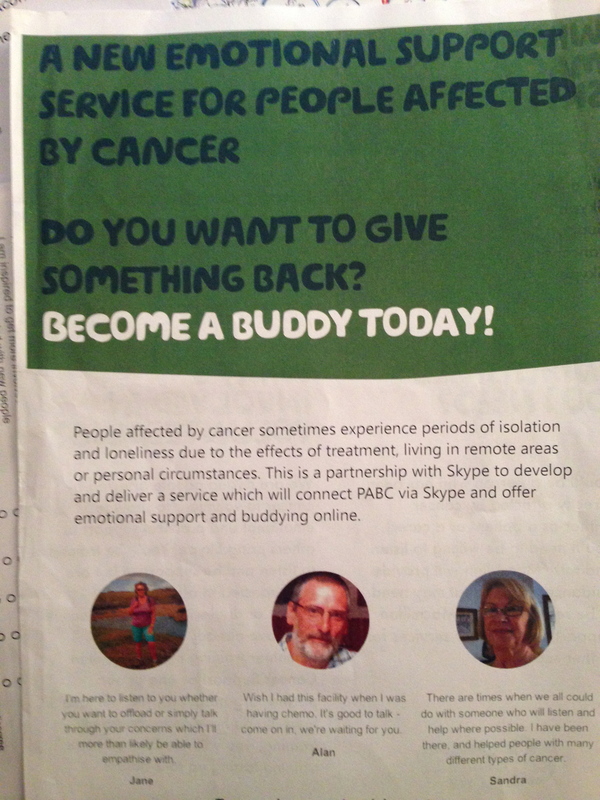 (Sadly to me, this came across as another plea for money and since we’ve all given up our time to be here and are Cancer Voices doing many things for Macmillan it feels insulting to ask for more!). Juliet then gave us some facts and figures about fundraising, numbers raised, spent and people living with cancer. This last year £137m has been raised of which £97m was spent on cancer support. 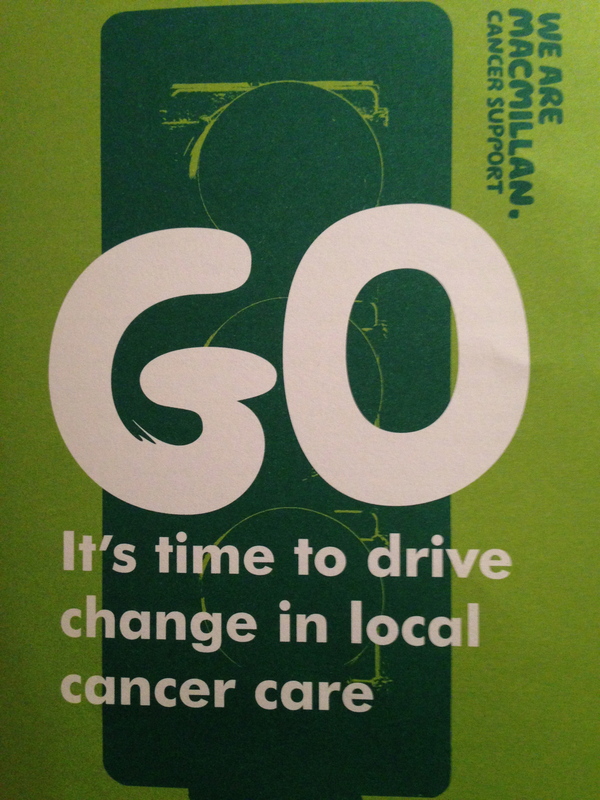 In 2030 Macmillan believe that the numbers living with cancer will be double that of today. Currently 2m people living with cancer. In 2030 they estimate 4m people living with cancer. There is an urgency not only for a cure for cancer but to ensure there is support and assistance for those living with and beyond a diagnosis of cancer. Often the emotional and psychological aspects are overlooked in favour of the physical. All three aspects need addressing and supporting. Juliet also spoke briefly about a Macmillan project to run training courses for all Boots pharmacists. Clearly they have a corporate deal with Boots but I’d like these courses to be offered to all pharmacists no matter which company they’re employed by. Personally I rarely see the pharmacist in a large Boots chemist but am more likely to chat to the pharmacist in a small chemist and aware that they often have more time for me too! Within our first Networking group we heard a story from another Voice about her experience of surviving cancer. This led to a group discussion about survivorship and where people had found support and information. We discussed the survivorsforsurvivors website, the Cancer Survivor’s Companion book, support groups within Facebook and Twitter and of course charity-led online forums. As also discussed how to ensure that any late effects from cancer treatment, particularly from childhood cancer treatment, was also supported. I think it’s so important that doors are left ajar for people who have gone through a cancer diagnosis at any age. Many people ‘just get on with’ cancer and then are left floundering some months/years later when they think about what they’ve experienced. Or that side affects take very different forms and are at very different times in ones life but still need addressing and supporting when they manifest themselves. There shouldn’t be a time limit on getting support. After lunch we headed off to our Workshop One sessions. I had chosen ‘Treatment Summary’. Treatment Summaries are a fascinating beast and once that has had much airtime of late. Essentially ‘Treatment Summary’ or ‘Patient Passports’ are a brief medical history of a patient’s journey with cancer. They are much like the ‘red book’ that parents were given when I was born and that documented all vaccinations, Dr visits etc until I was 16. Every parent managed to keep these books safe and take them with them on every medical visit their child made. What the Treatment Summary/Patient Passport is aiming to do is to keep a full record of the medical journey in one place. As a patient I am all too familiar with having to constantly ‘remind’ or tell my history with cancer, every date and every detail. The problem with this is that I may forget some detail or having not understood the medical importance of a piece of information, have missed it out. This then leads to problems. For the old/infirm or (err) unwell this is even harder to manage. Particularly if they have different family members or carers present at different consultations. All very valuable information and is a great idea. The barriers to this would simply be asking the medical team who are already stretched, to complete yet another form, ask them more questions and then to organise a method to send these treatment summaries to the GP (in addition to any usual paperwork). Another barrier may be that each Trust/Hospital/Clinician may require slightly modified forms or information. Then if the Treatment Summaries appeared in different formats at the GP office, they becoming confusing and laborious to read meaning that they may end up in a file unread. 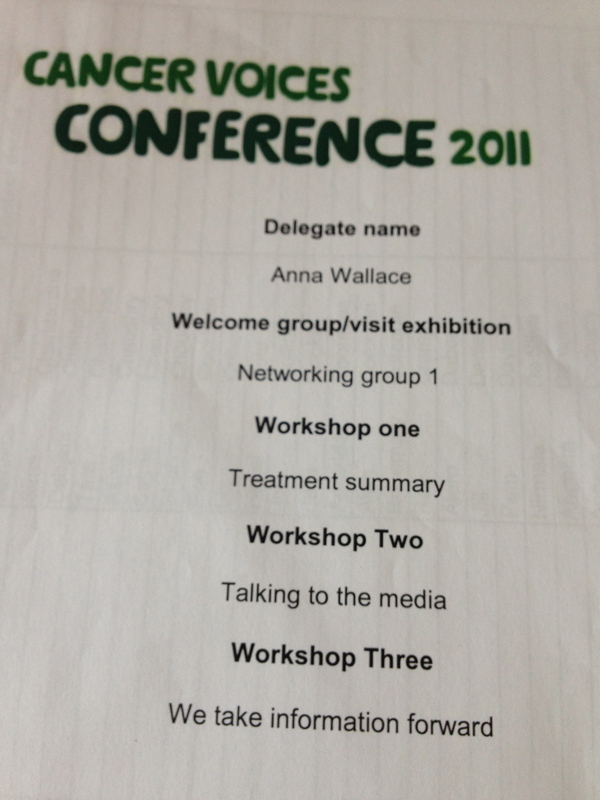 BUT equally disappointing was that Macmillan (Juliet Bouverie was present in this workshop) appeared to be completely unaware of the other organisations, charities and hospitals that had been working on their own Treatment Summaries. We have been discussing it on committees that I’m involved with at the Royal Marsden, NW London Cancer Network, SW London Cancer Network, C&W LinK for quite some time and I’ve seen the results of other people’s work. The Patient Passport (very similar to the Treatment Summary) is now live and working well for many. There are ones by Royal Marsden, Chelsea & Westminster, West Middlesex, East Cheshire, NWLondon/Imperial and many more. Some of these are ‘advertised’ as being required for vulnerable patients but can and are used for many more than just the ‘vulnerable. There are also private companies who sell ‘Patient Passports’ allowing the patient to keep a summary of all their treatment records and to take these with them to any medical appointment. Much like our parents did when we were children. Juliet seemed genuinely surprised that anyone else had thought of the idea of Treatment Summaries and promised to investigate. I’ve heard the argument that we would lose our patient passports. How many parents lost their red books? The difference between a Patient Passport -v- a Treatment Summary is that the patient/carer is responsible for their own information. This is in addition to the information shared between health organisations in the ‘normal way’ but adds another level of information easily accessible and digestible that the patient/carer can produce at every medical appointment… and update at the appointment too. What frustrated me about today’s workshop was the complete lack of awareness of any other organisation or NHS Trust work in this area. Macmillan have spent, I’m sure, a great deal of money on this project without consultation with others. As it is there are perhaps already too many Treatment Summaries out there. A GP in West London could well get sent 4 different types from the list of those already published. How on earth are they meant to know the differences on each? Most urban GPs will have 6,000 patients in their practice of which approximately 200 will be living with cancer. In the evening of the first day of Conference there is a dinner to which all attendees are invited. Always a good opportunity to meet new people and catch up with some old faces too. Our day begins in the main hall with a presentation by Michelle Soan, Inspiring Millions Programme Lead. She spoke to us about a new project called ‘Inspiring Millions’ as a way that we can spread the word about Macmillan and the reasons everyone should be inspired to fundraise for Macmillan. I can’t help but feel that since we’re all Voices attending the Conference the ‘hard sell’ is overkill but hey ho! Here’s their video explaining Inspiring Millions. This workshop was aimed at those of us who are often asked to talk about our experience, particularly with reference to the TV, newspapers and radio. 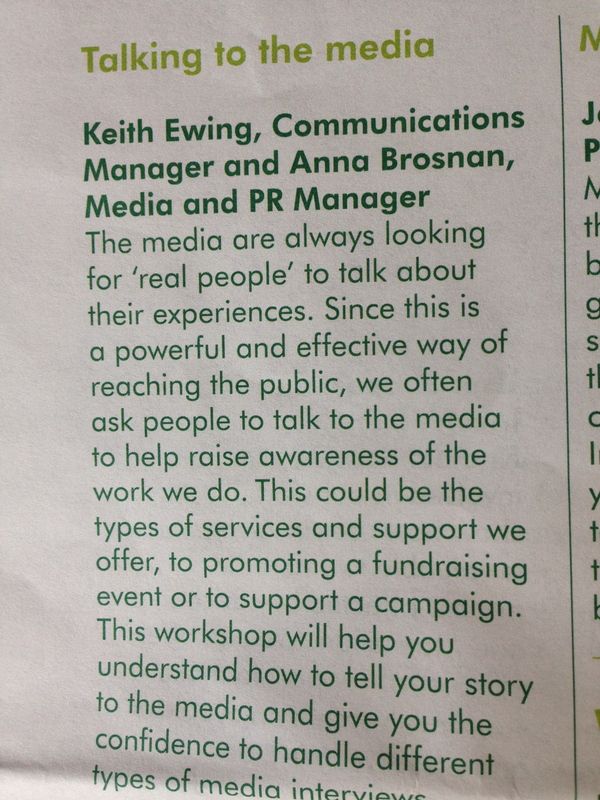 Many people in the workshop were able to share their own experiences of working with the media. For many it went well but for others they explained what had happened when they had been put on the back foot or perhaps hadn’t been briefed about the discussion properly. Many also spoke of the emotional aspect to share your story. It’s wonderful for others to hear and understand they are not alone in their own diagnosis but there’s a warning that often bringing up your own story brings with it memories or feelings that you’ve long since buried. Media is often very reactive to what’s happening in the world. Therefore you may be asked to participate with little or no notice. Always be prepared. Some TV/radio can be pre-recorded and edited. Be aware that punchy shorter statements are more likely to make it into the final version and not on the cutting room floor. Therefore word your important messages well.. and briefly. Always ask, when first contacted, if the piece will be live or recorded. If live, how long will you have to speak. Prepare accordingly. If your being asked to be interviewed for a written piece, ask to read it before it goes live in case of any inaccuracies. Ask what sort of questions you may be asked and if there are any you can see before the interview. Ask for a copy of the finished film, feature, interview or piece. It’s not always possible but if you can retain a copy for yourself, it will be useful. You don’t have to be an expert on the issue at hand but rely on your experiences and signpost to experts you are aware of such as Macmillan. Its useful to have 3 key things you want to get across during the interview. Then if you get stuck with a question you can guide it to one of these points. Have some water to hand so you don’t get dry throat. During filmed interviews always look at the reporter not the camera. Be aware that you may feel you have been cut short during a live interview. This is because of time restrictions not something you’ve said. Try to smile a little. Even on the phone or radio you can ‘hear’ a smile. Promoting Information Prescriptions – This system that was created and started by NCAT. You may recall that I spoke of my involvement as a patient reviewer here. My mention of it from the NCIN conference and my speaking at the recent Learn and Share event. So this was where the project had got to… Macmillan had taken it over. No wonder why the wonderful reviewer system had broken down. How incredibly sad that NCAT had a host of trained volunteers who were ready willing and able to review, write and process the information quickly and efficiently. So that many information pathways can be put into the system and accessible to people needing it at a time when they need it. Why on earth wasn’t this aspect of the project taken forward and at the very least these trained volunteers asked if they’d like to continue the project for Macmillan instead of NCAT? During the workshop we have a walkthrough of the system and I’m astounded at the level of basic information there now is for cancer. It all appears generic and I know that there is little hope of getting any information about any rare cancers or support for them from the system. Have a look here. Getting involved in Information & Support Services – Macmillan run over 140 cancer information and support services across the UK. In hospitals, libraries, community centres and hospices. The services offered range from information about specific cancers, treatment options, signposting to relevant clinical, social care or obtaining travel insurance, understanding the information or simply having time to talk. Each centre is run by a team of people including an Information Specialist and trained volunteers. Cancer Voices are encouraged to volunteer. Getting Involved in reviewing books – Macmillan use reviews by people affected by cancer to help compile a list of suggested books for use in public libraries and information centres. Reviews are also added to Macmillan Cancer Support website. A link to a review of the wonderful Lisa Lynch’s book ‘The C-Word’ here. Cancer Voices regularly get asked to review books. Promoting core book list in libraries – Macmillan have put together a list of core books that are recommended to librarians about cancer. This list should allow them to make informed judgements about which books to stock, how to select and appropriate range of materials and when to replace books. This guide will also enable to librarians to recommend specific books when asked by the general public. Cancer Voices are being urged to get involved by working with Macmillan to contact libraries local to them. The Conference closed with a session entitled ‘One Voice’. The programme said this would leave us “feeling positive, energised and confident.” Sarah Warwick who hosted this session asked the group to stand, dance, move and sing. An interesting ask and very isolating for those that were in wheelchairs, crutches or unable to move easily. Even harder for those with a tracheostomy. As I watched the group of attendees cautiously attempt to follow the instructions, I also noted a trail of people heading for the door and home. I shortly followed them out. Furious on behalf of all those who ended a two day conference where they had volunteered their time, energy and commitment to Macmillan to leave feeling humiliated that they couldn’t participate in the closing session. I’m quite sure, like me, they didn’t leave feeling any kind of positive, energised or confident.